Perhaps it’s the holiday weekend, but Bloody Marys are in the air. I have to say, I don’t drink Bloodies very often. I don’t like the flavor or texture of most commercial tomato juices, as they tend to be heavy on the palate and the tummy. Often, I feel like half my meal becomes the Bloody, since it’s so filling. However, Jen loves them, and so I’ve learned to make them at home, and when I start with good ingredients, I’ve learned to like them myself. I’ve written up my Bloody Mary recipe before, but I’m going to revisit it today, but with a twist. Back then, Anita from Married With Dinner urged me to try a homemade tomato juice. It’s taken quite a while to get around to it, but I finally did. Well, sort of. Jen made the juice; I made the Bloodies. After the break, her technique, but first, a pretty picture. She started by blanching and peeling a dozen fresh plum tomatoes. She chunked them up and puréed them in a food mill before pressing them through a fine metal sieve to remove the seeds. Because we were planning to use it for Bloodies, she left it unseasoned. A food processor will work for the purée, if you don’t have a food mill. My friend Ed Mathews makes a kickass habanero hot sauce called Evil Hot, and I added a teaspoon of this to the tomato juice, plus Worcestershire, Fee’s Old Fashioned Bitters, lime juice, horseradish, and the Colonel’s secret blend of 11 herbs and spices. Yummy, and perfect with the bread pudding Jen made for brunch. Doesn’t fresh tomato juice make ALL the difference? It’s a good use for seriously overripe tomatoes, too — and the grocery store usually has at least a couple of them in the UglyRipe bin. It’s not even 9am, but that drink looks deelish. Tomato is still a flavor I’m challenged with. I can drink a bloody mary, but have yet to really crave one. I’d like to think the tomatoes in my garden could make the difference, and will have to give it a try. and, if I may ask, what exactly is that garnish? Ah, the Bloody Mary! The first drink I learned to make—it holds a special place in my heart. Mrs. Bitters—do you like green beans? I garnish mine with pickled green beans, as I’m also not much on the celery. I also like to garnish with pickled carrots. Marleigh – I do like green beans! I was hoping to pickle some this year, but the ones we planted didn’t produce very well, and I have been concentrating on blanching and freezing our greenmarket beans for future use. I’m going to try to get a batch of pickled ones done this season though – it sounds like a great garnish for these, as do the carrots. Thanks for the suggestions! Hello! New around here, but a cocktail nerd so I think I’ll be back. 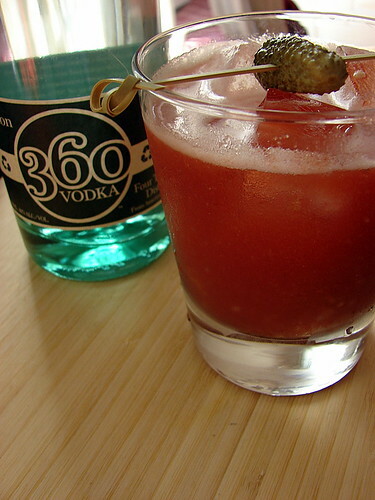 Something that has helped me to get excited about Bloody Marys – I never was much of a raw tomato eater – is a particular Vodka. Nemiroff makes a honey pepper infused Vodka that just screams Bloody Mary and the results are excellent. Nemiroff just began being imported through Nashville, TN, a couple of years ago, but I hope it has reached your market by now. If you can find some, give it a shot. They’re very reasonably priced, and their regular Vodka is excellent stuff as well. It’s a Ukrainian wheat Vodka, very good straight up and a good base for cocktail mixing. Cheers! Howdy! Someone in my Facebook group shared this website with us so I came to give it a look. I’m definitely enjoying the information. I’m book-marking and will be tweeting this to my followers! Fantastic blog and superb design and style.